The hunting story below was written by Jim Jones, California, USA. He and his wife Mary with friends Buz and Bonnie, came in 2004 together on an African trip. Jim wrote a book about this hunting safari to Africa. 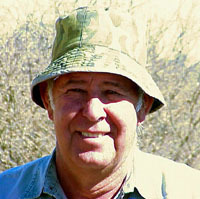 The Huntington's and Jones' African Escapades 2004 is a detailed description of their trip to Namibia. The four friends visited us on Uitspan Hunting Ranch with Volker Grellmann, a respected and admired PH from Namibia. Kobus, our friend and also a PH, was the pilot that flew them out here and joined the hunt. 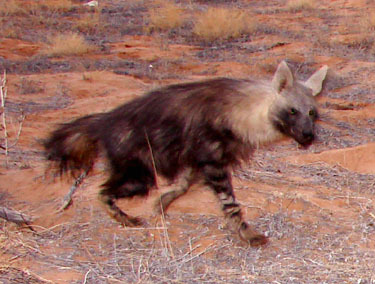 During their time on Uitspan, it happened that a brown hyena (see picture above) gave a lot of problems on the farm of my brother, Awie Steenkamp. The predator killed several sheep in more than a week and since these animals are quite densely populated in the Botswana part of the Kalahari, they often come into the farms next to the border and cause havoc in animal herds. It had to be killed to prevent further huge losses. Jim and Buz were lucky to be here that day to experience the "expedition". Have you visited our "African Hunting Story-page"? This is how Jim described this day (15th in Namibia) of their African Escapades on Uitspan Hunting Ranch in the Kalahari. We find the description of the hunt, told from his point of view, very amusing. That is why I want to share this with you! We drove to the main ranch house where we were invited into the house for yet another breakfast. We sat at the round dining table that had a center lazy susan loaded with bacon, sausage, fruits, jams, muffins and biscuits. Isabel served us eggs, cooked to our preference and encouraged us to gorge to our extents. We did so and it was wonderful. The dining environment was elegant. However, we were scruffy to say the least. The contrast between us and Isabel's well ordered home was paradoxical. 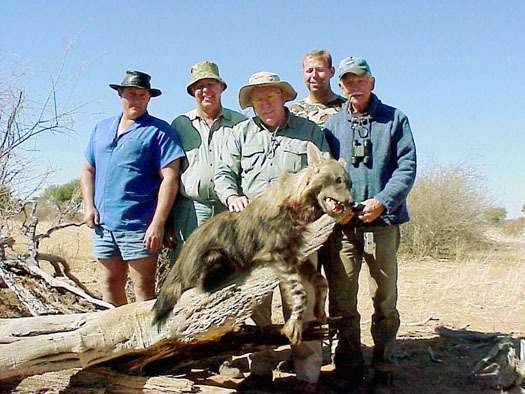 The PHs Volker, Kobus, Hendrik and Michael reviewed what was known about this particular hyena. At times they succumbed for convenience and spoke in their native Afrikaans language. Enough was said in English for Buz and Jim to get te gist of the conversation. The neighbors vehicles would join the hunt from opposite sides from where we would start. Radio communications would keep the hunters on track. The initial perimeter would actually be several miles. 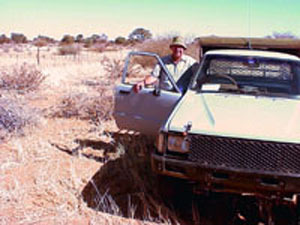 Four or five vehicles would be used along with four bushman trackers. The vehicles would circle the perimeter in ever smaller circles thereby driving the hyena toward the circles center. We left the ranch house about 8:00. Buz and Jim went in Michaels hunting truck. Kobus went with Hendrik. We drove about 30 minutes until we reached the Botswana border with its line of double fences separated by a 100 foot corridor between. Hendrik took the lead racing over the desert roads at 50-60 mph, periodically stopping while one of his ranch hands added water to the diesels radiator or opened one of the many gates separating elements of the large ranches. There were radio communications. Buz and Jim were hanging on, more or less along for the ride. They were dazzled by the matter of fact, organized process. The hunt was unfolding about them as though it had been done a hundred times. The PHs and the bushmen trackers kept one eye on the sandy roadbed for hyena tracks. Soon our truck (Michael driving) was the only truck in sight. We drove a very large circle. Radio conversation became frequent. Then we left the road and were simply in the bush. Occasionally we heard other trucks. 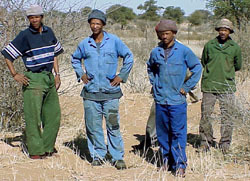 Bushman trackers on foot were seen now and then in the distance (this picture of them was taken after the hunt). But our truck was alone as a component of the hunt. Driving in the bush, off the roads, was an adventure in itself. Although Michael was a deliberate, precise driver, driving a modest 15 to 20 mph, avoiding scrub trees, boulders and ditches, Buz and Jim were fully occupied hanging on to whatever to avoid being banged about in the back of the steel truck bed. Round and around we drove. The circle growing ever smaller. At one point three trucks converged. Excited conversation followed. The spoor indicated we were very close. The trackers left on foot. Jim transferred to Hendriks truck. In Michaels truck, Buz was getting the .375 ready. Hendrik told Jim to sit up front with him. Then he asked, in a commanding manner, Are you ready? (Up to that moment, Hendrik spoke English sparingly, perhaps believing his English insufficient. Whatever had been, changed. Now he was in his element, assertively very much in-charge. The hyena was about to be in serious trouble.) Jim wasnt sure what to answer but said, Im ready anyway. That said, the truck leaped forward, never pausing for rocks, ditches, riverbeds, small trees or boulders. At times the speedometer showed 100 kilometers (60 mph). Buz and the other trucks disappeared into the bush. It was obvious to Jim, Hendrik was driven by instinct and Kalahari experience. He intuitively knew how and where to execute the pursuit. Jim looked at Hendrik, who was driving as if we were the Rat Patrol, chasing Rommel in the Sahara. Jims face was enough. Hendrik yelled. All the while jumping over ditches, rocks, boulders, logs and whatever else was out there. Jim, mindful of the PHs incessant lectures and mandates concerning gun and ammo status, approached the matter with caution. Three bullets were easily accessible in Jims shirt pocket. The .06 however was between his legs, barrel up, with little vertical room to perform loading manipulations. Despite the awkward limitations, Jim made an attempt to load the rifle. Hendrik was observed shaking his head as Jim busily picked up the bullets that had fallen and were now bouncing on the floorboards. Jim next opened the side window thinking he could get more space if half of the rifle was outside the cab. As he cranked the window, which was cracked and broken, the handle came off in his hand. Meanwhile, the Rat patrol continued, full bore, after Rommel. Finally Jim got the window down and with great deliberation was able to get three rounds in the .06. Again, Hendrik was observed appraising Jim with a speculative eye. The pursuit continued at speeds of 50 to 60 mph seldom in a sustained straight line but rather in an inexplicable pattern probably to avoid some insurmountable hazard to the truck. Hendrik exited a patch of dense bush. Directly in front came the hyena, running at the perimeter of the bush we had just left. It was fast, running with a distinctively peculiar lope. Seconds later it passed and disappeared from sight. Undaunted, Hendrik turned, heading in a new direction intending to out-flank the animal. Seconds later, two trucks came into view from opposite directions. Just as suddenly, the trackers appeared. The force was impressive and hot on the trail. Weaving in and around patches of dense bush the hunt moved at full bore. Somewhere along the way the trackers climbed aboard the trucks. Hendrik managed to stay in the lead most of the time. The hyena occasionally was absorbed by the bush but the threatening sounds and scents of the hunt would flush him out. From time to time the radio barks. Its all Afrikaans, but everyone knows whats going on. The trucks are going the same direction now, following the loping hyena. In, out and around clumps of bush. The objective is to kill it before it can escpae through the border fence into Botswana. The rat patrol was maneuvering to herd the hyena into position for Buz to shoot. We havent stopped for the last 20 minutes. Radiator steaming, Hendrik broke out of the bush onto the road that parallels the Botswana fence. Michael with Buz, was close behind. 75 yards ahead was the loping hyena. The road was straight and fenced on both sides. The easiest escape path for the critter was straight down the road ahead. On the picture above you see from left: Awie, Hendrik, Buz, Michael and Jim (who has put this experience on paper). Kobus skillfully opened the hyenas belly and emptied its contents. Everyone was astonished by what we saw. A complete lamb, head, legs with hoofs and all, were in the stomach, undigested. What more incriminating evidence was needed? The mornings events occurred in a naturally seamless way without much discussion. Throughout the hunt, the PHs remained matter of fact, confident of success. Always saying, "Well get em." In any other setting such conficence would have seemed speculative and perhaps a little off putting. Here, results speak for themselves. These people know their stuff. With the hunt over, an anticlimactic calm followed. Everyone participated in filling the vacuum, reliving their part of the adventure. Each aspect of the adventure was recounted, often with an amusing anecdote. Even our bushmen trackers had something to say. We had some good laughs. For Buz and Jim, the day was a priceless adventure to be reflected upon in years to come."